Perhaps to the disdain of mobile carriers, Nokia continues to ramp up its own music offering. Three new music-focused handsets were announced today, along with expansion of the company’s own music download store and all-you-can-eat ‘Comes With Music’ subscription-based offering. 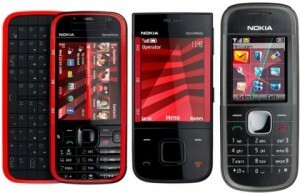 Of the three new handsets, the most interesting is the higher end XpressMusic 5730 (available Q3, €280), which is Nokia’s first music phone to feature a full (slide out) QWERTY keyboard, and just like the 5800, runs the company’s Symbian S60 smartphone OS. The 5730 is being pitched as both a music-centric and messaging – think email, IM and social networking – device, featuring a redesigned home screen that gives shortcut access to the phone’s music library, and the socially-aware ‘contacts’ bar, which is able to pull in the latest communication and RSS feeds from up to 20 of a user’s most important contacts. In addition to the XpressMusic 5730, the mid range 5330 slider was unveiled (Q3, €260), along with the 5030 XpressRadio, which is being targeted at emerging markets (Q2, €40), and is Nokia’s first phone to feature an internal FM radio antenna, eliminating the need to use a headset in order to get reception. On the services front, the Nokia Music Store (see video), which is currently available in 15 countries, including the UK but not the U.S., opened its doors in Mexico today, “with additional markets such as Portugal, Norway and South Africa joining the fold in the coming months”, according to the press release. While Nokia’s ambitious all-you-can-eat music subscription offering, ‘Comes With Music’, which is currently limited to the UK and Singapore, will arrive in Australia later this month, with Italy, Sweden and Mexico to follow. Again, no word on a U.S. launch.